Note: After getting curious after visiting the restaurant and writing this post, I put all of Chess’ Instagram pictures through Google’s reverse image search. Six out of 27 came back as being definitely not original pictures despite being passed off by Chess as their own food. I suspect that others are as well. 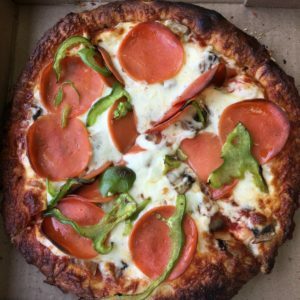 After seeing some pretty pictures on Chess Pizza’s Instagram feed, I made a mental note to try them out. When it turned out that I would be near-ish to them while running some errands, I made a slight detour to indulge. The shop itself is on a side street just off Bank Street, on the western edge of Alta Vista. It shares space in a strip mall which has a diverse clientele, which includes a Muslim women’s clothing store, an Arabic coffee roaster/candy retailer, a Middle Eastern restaurant, and a Chinese takeout spot. 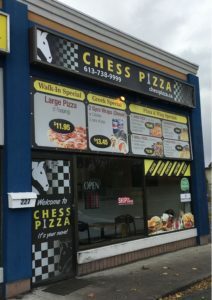 I’m not sure why they chose “Chess” to be the name of a casual pizza joint, but they are all in on it – chess pieces and the board pattern are in their signage and menus, along with chess-related puns. There’s even what I can only assume are pictures of chess grand masters/champions hung around the top of the room. I don’t know if it’s pulling customers in, but its randomness is amusing. Walking up to the counter to order, I mention an offer I received in a message from them when I followed their IG account – a small pizza, six chicken wings, dipping sauce, and two drinks for $13.99. I chose their combination pizza toppings (pepperoni, mushrooms and green pepper) for my pizza, and a medium hot sauce for the wings. Grabbing one of their menus, I took a seat at one of the two small tables to wait for my food. I had been impressed by the pictures of Chess’ pizzas and burgers on their social media, so I had high hopes coming into the place, but this hope was slowly worn away bit by bit. Not to judge a book by its cover, but it doesn’t look any different than the mediocre neighbourhood pizza joints that populate the world over. You never know though, and I myself am a big fan of diamonds in the rough. I had further cause for concern when I noticed something about that wonderful deal that they give you for following them on social media. It’s actually $1.04 more than the exact same special that’s listed in their menu. I got charged the lower price, but the somewhat deceptive message sent out on social media is BS. While pizza joints are known for having large menus, with “meh” sandwiches/wraps, and straight-from-the freezer appetizers, fish and chicken, the menu at Chess takes things up a notch. An Italian section makes perfect sense, although I wouldn’t be confident in the freshness of their veal parm. But a Mexican section? So many mental warning flags (checkered, naturally) went up at seeing this. And no, I’m gonna take a pass on the fajita, thanks. After a short wait, I soon had my food in hand and took a seat to dig right in. Opening up the pizza box, some of the saddest, cheapest-looking pepperoni I have ever seen stared back up at me. If Dollarama sold pepperoni, this would be it. 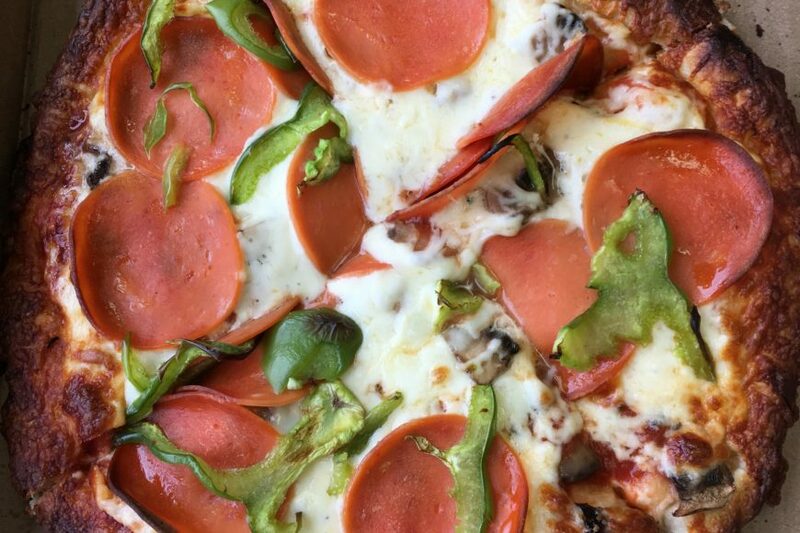 I don’t know what happened to the dark, crisp slices of pepperoni they show on their Instagram, but these pallid, sorry excuses for meat were something else entirely. The pizza as a whole had the odd condition of having a nearly-burnt crust, but cheese and pepperoni that weren’t even browned (again, divergent from all of their pretty pictures). That slightly overcooked taste dominated the pizza, with the sauce not really announcing much of a presence flavour-wise. Speaking of the crust, it was on the thicker side of the spectrum, but it was a bit mushy in the centre of the pie, although mushrooms don’t help with that. To salvage something positive from this, the cheese was plentiful, and I appreciated the hand-cut, imperfect beauty of the green peppers, but that’s about it. 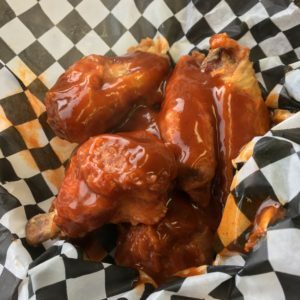 The wings were about what you expect – from a freezer, light batter, with a Sysco-esque sauce poured over them when they packaged them up for me. I’ve had worse wings, but these aren’t the wings that you want when you need to get your fix.